Larry Spring was born Lorenz Niels Spring, December 6th 1915 in Oakland California to Sidney Reed Spring, a railway mail clerk and Marie Katherine Lund. Larry spent his early school years in Healdsburg, Corte Madera and Cloverdale CA. In 1919 the family bought a remote ranch where Larry learned resourcefulness and a developed a keen sense of observation. As a boy he raised bees, carrier pigeons as well as berries and vegetables. He grew up fishing and hunting and collecting Indian arrow heads. He was fascinated by radio transmission and built crystal radio sets, which he assembled from scratch using Quaker oats mush boxes, wound wires, crystals and cat whiskers. He loved airplanes and as a boy he dreamed one day of becoming a pilot. Larry started out with a basic high school education, graduated in 1933 and worked his way through the school of life with an inquisitive mind. When Larry was 22, he made several visits to the 1937 Worlds Fair at Treasure Island with his brother Sid. There, Larry saw a closed television transmission for the first time. Larry also saw an automobile motor rotate under a strobe light which made a spinning object appear to stand still. Larry was also interested in farm stock and the other amusements of the day. In the early 1940's Larry worked as a carpenter in Los Angeles, then at Tim Aircraft Company in Van Nuys. In 1943 he entered the army in Monterey. In 1944 Larry graduated as a pilot 2nd Lieutenant from Altus Oklahoma?s Advanced Army Flight Training School. At age 27, Larry realized his dream of becoming a pilot. During World War II he flew transport planes between Casablanca, Tripoli, Cairo and Naples. Larry?s specialized training in instrument instruction both revived his early interest in radio, and led to his becoming a special instructor for night and instrument flying. Larry took advantage of the slip stream out the window of his plane to advance his knowledge of aerodynamics and wind resistance. Post war Larry owned and operated a television sales and service shop that specialized in antenna design and installation. In 1954 Larry independently confirmed the speed of light with comparison dipole antennas and a field strength meter. (Once he had measured one wavelength, he multiplied it by the frequency and its speed turned out to be the same as the speed of light.) Through experimentation and common sense Larry also simplified the periodic table. Larry prospered in the 60's and 70's in real estate, and pursued several hobbies. These included rock hounding, painting, wood turning and wood sculpture. In 1983 Larry bought a satellite dish, which revived his interest in television and radio reception. He analyzed in depth the characteristics of transmitted energy throughout the electromagnetic spectrum, from direct current to gamma rays, and more particularly, from AM radio to visible light. He also performed a series of in-depth experiments to determine the true form electromagnetic energy takes from transmission to reception. This was quite easily accomplished, thanks to his television antenna background and television circuitry experience. Saying this, however, does not convey the intense interest and tenacity with which Larry pursued, and continues to pursue, this knowledge. Larry studied college physics books, like Harvey E. White's Classical and Modern Physics, and consulted the Encyclopedia Britannica. He quizzed intelligent retired people with a background in physics, in an attempt to gather information not available in books. Larry still reads library books and magazine articles, and every so often, while wading through pages of redundant or repetitious information, a little jewel shines out which adds new dimension to his analysis. Larry has demonstrated and lectured on his discoveries and experimentation throughout the 90?s at numerous institutes including the Borderland Science Institute Convention in Santa Barbara, The International Tesla Society (of which he is a lifelong member and main speaker), at the International Academy of Science Convention in Kansas City, as well as numerous Solar Fairs and private functions. 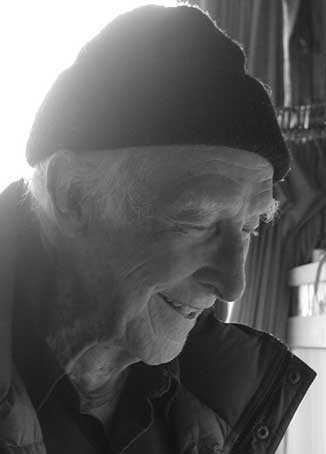 At age 89, 2004, Larry continues to demonstrate and teach private classes at his School of Common Sense Physics located in Fort Bragg California. Larry uses energy itself as his primary teacher and relies on logic to keep him on the true course.